All the information on this page is also avalilabe on the Army's website. Click here to jump to their site. Click here to view the end of an interview. It really says who he is by his closing statement. Click here to hear the Veterans Radion interview (www.vwteransradio.net) with Ltc. Kettles and Ltc. Long as they discussed the events of 15 May, 1967. WASHINGTON (Army News Service) -- The bullets came in fast and furious, a hail so thick it seemed like rain with a fog of green tracers. The men of the 176th Aviation Company were used to hot landings after months in the highlands of Vietnam, but this, this was something else. 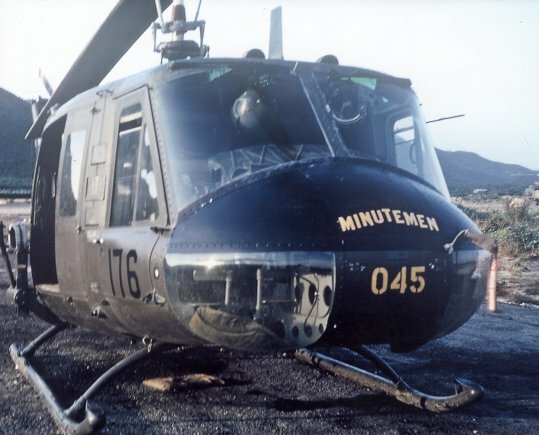 A battalion's worth of fire -- small arms, mortars, grenades -- seemed to be trained on the Hueys all at once, clipping rotors, windshields, fuel lines. Still the pilots flew, their blades whirring and thunking as they approached the landing zone. They had been flying back and forth all day, bringing in fresh troops and ammunition, taking out the wounded as the battle went from bad to worse. Forty-four Soldiers were on the ground, outnumbered, outgunned and desperate. It would take a hero -- several heroes, actually -- to rescue them, to get them home safe to their parents, wives and children. It would take daring, bravery and guts. It would take someone like now-retired Lt. Col. Charles Kettles, who led the rescue -- and then went back again -- and will receive the Medal of Honor for it in a White House ceremony on Monday, July 18. Kettles was born to be a pilot. His Canadian-born father served in the British Royal Air Force during World War I and the U.S. Army Air Corps during World War II. He raised his son around planes, and Kettles grew up assuming "everyone would want to fly." So when Kettles received a draft notice at the close of the Korean War, he was excited. It was an escape from two full-time jobs and an opportunity to "sleep in to as late as 6 in the morning." It was also a chance to fly. He served in post-war Korea, Japan and Thailand. He married and had children, one of whom would eventually fly for the Navy. He opened a Ford dealership back home in Michigan with his brother. Then he volunteered for Vietnam. "The Army was in need of pilots," he explained. "They had spent a great deal training me. … I think we all have an obligation in this country to respond where the need may be. … It's your country. It's up to you to protect it." 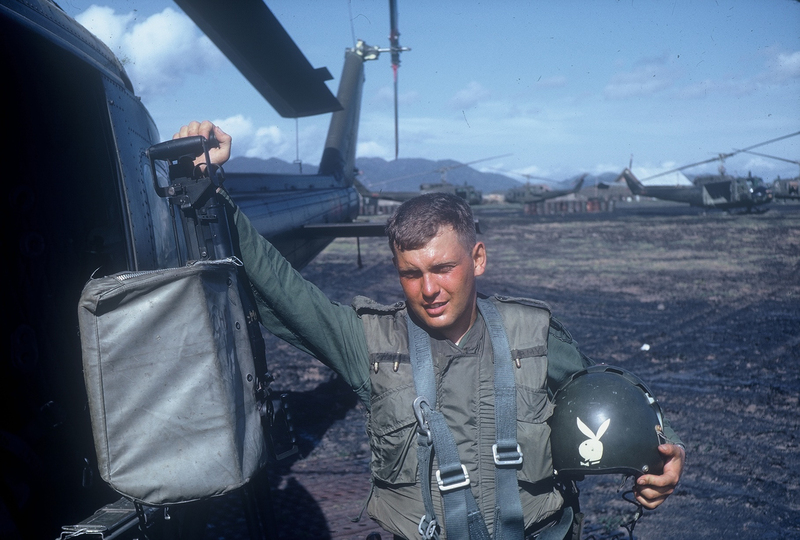 Then-Maj. Kettles deployed to Vietnam in early 1967 as a platoon leader and aircraft commander with the 176th, part of 14th Combat Aviation Battalion, Americal Division. "You questioned why anyone would be at war," he remembered. "They had so much territory that seemed to be unused. … It was an absolutely beautiful country." Flying a helicopter was the best way to see it, too, added Kettles' gunner, Spc. Roland Scheck. Up a thousand feet or so, above the jungle canopy, the humidity decreased. Crews flew their helicopters with the doors removed, a weight-saving measure that also made for some free air conditioning. "It was wonderful, absolutely wonderful," said Scheck. "It was like a motorcycle in the sky, going 160 miles an hour. … It wasn't so gorgeous if you were down there working in one of those rice paddies, but if you flew over it, it was wonderful." The war started for the company in earnest a few months later when it was assigned to support the 1st Battalion, 327th Infantry, 1st Brigade, 101st Airborne Division. The infantry unit always seemed to be in some sort of contact and it was the pilots' job to transport and supply them. "Whenever we were told, 'tomorrow we're going to fly for the 101st,' all the gunners and crew chiefs said, 'Oh s---,'" said Scheck. It meant trouble was sure to follow. Then-Sgt. Dewey Smith (right) was in the weapons platoon of B Company. 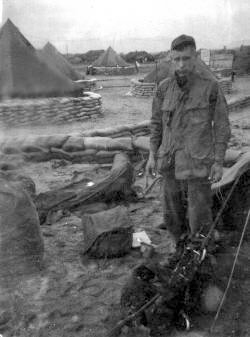 His unit spent two, three, even four weeks straight in the field. "Somebody in the brigade was continuously fighting each day, and if you weren't in contact, then somebody was stepping on a landmine," he said. "They were always in action," said retired Lt. Col. Ronald Roy, then a pilot and warrant officer. Pilots typically flew 10 hours a day, although 16 or 17 hours wouldn't be unusual. "Being shot at or having an aircraft shot up was routine every day. That was one tough unit and if they were there, we were there. … It was like brothers taking care of each other." By the second week of May, things got "pretty hairy," near Duc Pho in the highlands, said Smith. His platoon confronted more than 100 enemy soldiers on the May 13. Another company was overrun the next day, while six other Soldiers found their reconnaissance patrol compromised. Kettles and another pilot managed to rescue them from a B52 bomb crater minutes before another bomb strike. Kettles earned the Distinguished Flying Cross for his actions, an award that would be overshadowed by events the very next day, May 15. That's when the 176th inserted another reconnaissance patrol in a valley Soldiers nicknamed "'Chump Valley,' because someone said only a chump would go there," Kettles remembered. The men soon confronted a large enemy force, and Smith's weapons platoon and his company's 3rd platoon were called on as reinforcements. The enemy "really opened up on us. It was just continuous," Smith said. The battle seemed hopeless from the beginning: 80 versus a battalion-sized force with only a small, shallow creek and a few trees and bushes between them. "I'm not going to say that I was afraid, but I was extremely apprehensive." The battle raged for hours, and even heavy artillery and airstrikes couldn't dislodge the enemy, who would simply duck into bunkers and wait for the explosions to end. Retired LTC, (then Captain) Donald Long (arms crossed). Pilots Roy and Long were awarded the Silver Star. Pilots from the 176th made several trips, bringing in ammunition and reinforcements and evacuating the wounded. There was only one direction they could use to approach the landing zone, Roy recalled, and North Vietnamese forces poured hellfire on them in what he still believes was an ambush. It was certainly some of the most dangerous flying he ever saw in either of his tours in 'Nam. 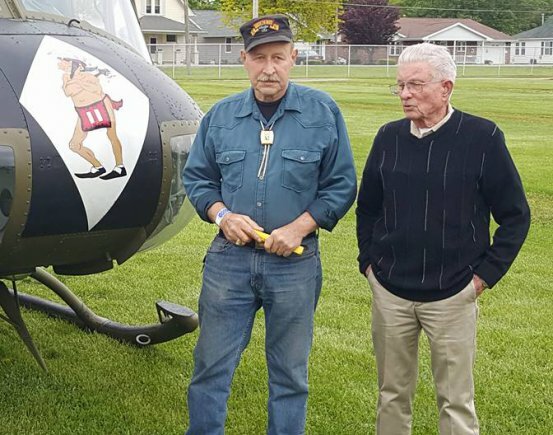 "It was like rain … coming straight up out of the wood line," described Roy, (left) who earned a Silver Star. "Without hesitation, we flew through it. … We got shot at every day, and you'd lose a rotor blade or whatever, but never to this intensity." "You saw those green tracers coming at you," said Scheck. "They looked like each of them was going to get you right between the eyes." 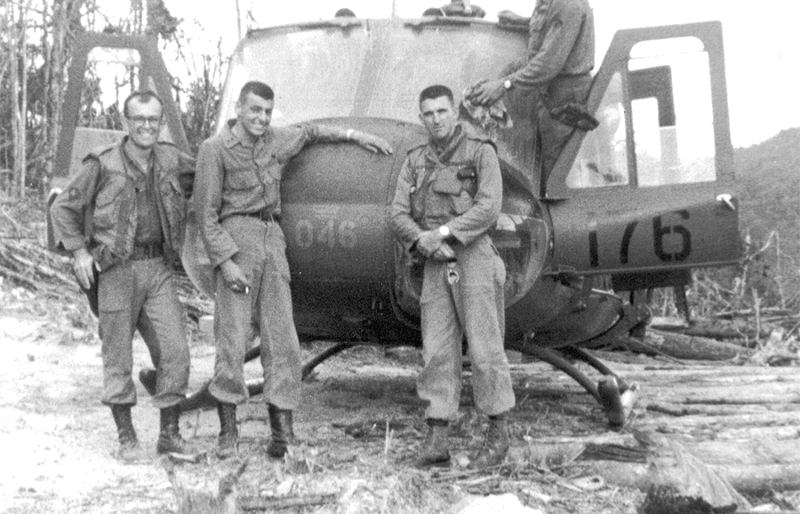 Two wounded Soldiers had dived into Kettles' helicopter just as a volley of bullets sprayed the aircraft, leaving about 30 rounds through the Huey. On their way back to Duc Pho they passed Roy and Long's Huey returning for their second rescue mission to Chump Valley. They radioed Kettles that he was leaking fuel. Kettles made it back to Duc Pho trailing fuel, but Scheck was wounded in the arm, chest and leg, which ultimately lost above the knee. He would receive the Distinguished Flying Cross in addition to the Purple Heart. "I was the first guy whose life he saved." said Scheck. The fire was so withering, Roy continued, "Soldiers couldn't even leave the limited safety of the trees to deliver the wounded to our helicopter, which touched down in the middle of the LZ. They would have been mowed down in seconds". He maneuvered his helicopter closer, but a mortar struck between the rotor blades, severely damaging the aircraft, wounding Roy's copilot then-Capt. Donald Long in the leg and turning the four crewmembers into infantry Soldiers. Both pilot's Roy and Long received the Silver Star and crew members Sp4 Hawley and Pfc Washington each received the Distinguished Flying Cross. By late afternoon, the 176th Aviation Company was down to one working helicopter and 44 Soldiers who were fighting for their lives in Chump Valley. Scheck and Roy both remember hearing from multiple people that commanders ordered Kettles to stand down. 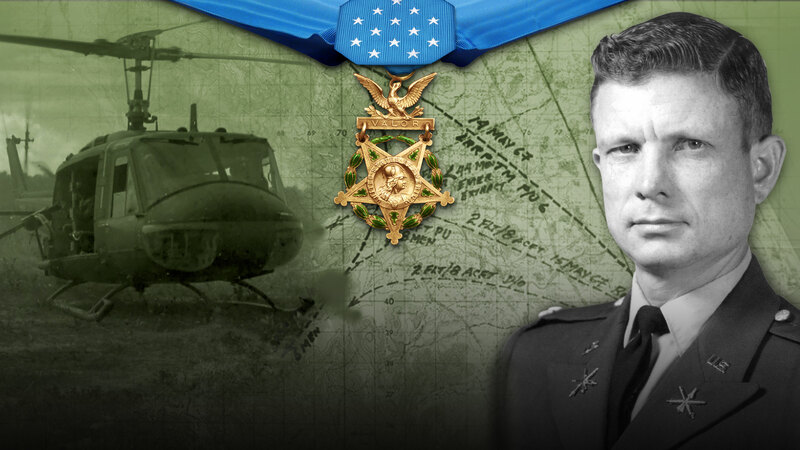 He coordinated with the 161st Aviation Company to obtain more helicopters and crews, scraping together six helicopters. It was another hot landing, but the gunships and the artillery provided enough suppressive fire for the Soldiers to board. The last pilot in the formation confirmed they had all the Soldiers, and the helicopters took off. But he was wrong, dead wrong, someone from the command and control aircraft yelled over the radio. Eight Soldiers had been fighting a bit of a rearguard action and had been left behind. From the ground, Smith watched the last helicopter take off: "If it's possible for your heart to fall into your boots, that's what mine did. I had three rounds left in my rifle. … My first thought was that I was going to have to start hauling boogy down the side of the creek and try to lose myself in the brush to start escape and evasion." Horrified, Kettles turned his helicopter around. He only had one "ground pounder" aboard whereas the other Hueys were full. "You've got eight troops there," he explained. "I happened to be there, available, with the equipment to do it. If you left them for 10 minutes, 15 minutes, they would have been a statistic somewhere, either dead or prisoner of war." The gunships were gone, the Air Force had been called off and the artillery was silent. Armed only with two machine guns, a couple of revolvers, a lot of nerve and the element of surprise, Kettles "ratcheted up into a steep, left descending turn. It falls like a rock, and touched down." Smith thought for sure the helicopter would either be shot down or be forced to turn around. The hail of machine-gun tracers and mortars was that intense, but Kettles never flinched, even when one "mortar round went off almost immediately off of the nose and took out part of each windshield and the chin bubble" and another damaged the tail. "The emergency panel was still cold, no red lights," Kettles continued, joking that "the air-conditioning was good, with ventilation through the windshield and the chin bubbles." The GIs sprinted to the helicopter "pretty dog-on fast," Smith remembered with relief. "All eight of us, we were hauling boogy. Nobody wasted any time. It was quick, seconds." They were still under fire, and now they were at least 600 pounds overweight. The Huey fishtailed. "I had to lower the collective to get my rotor (revolutions per minute) back up," said Kettles. "Leaving the nose of the skid on the ground, I put the RPM back up again. I'm trading that RPM for forward speed to put it in translation lift, which will give me clean air. If it's going to go, it will go at that point, or we're all 13 of us going to be infantry again. "I didn't know whether we were going to get out of there, but I was going to give it my best try. After about five or six of those down the riverbed, it did fly -- like a two-and-a-half ton truck." When the men finally made it to safety, mechanics counted almost 40 holes in the aircraft. Smith was numb, so shell-shocked at first that he didn't even recognize a buddy. For his part, Kettles assumed, "That's just what war is. … We completed the thing to the best of our ability, and we didn't leave anyone out there. Let's go have dinner." Much to his disgust, Kettles' commander moved him into flight operations, asking Kettles what they were supposed to do without any helicopters. (In reality, the company managed to get back in the air very quickly.) 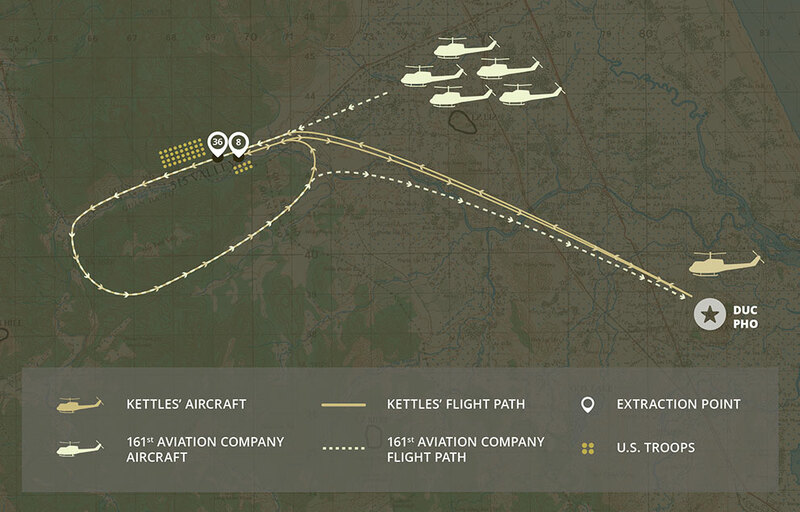 Then Kettles became the brigade aviation officer, but he didn't want to be behind a desk. He wanted to fly. Kettles reluctantly accepted a Distinguished Service Cross for actions he didn't think were anything special and moved on with life. He returned to Vietnam two years later, commanding the 121st Assault Helicopter Company in the delta. He eventually found his childhood sweetheart again and got remarried. He retired from the Army, went back to school and helped found the aviation management degree program at Eastern Michigan University. And then a local historian, AVVA member Bill Vollano, came to interview Kettles for the Veterans History Project. He dragged the story out of Kettles. He wanted to know more. He thought Kettles deserved more than the nation's second-highest honor. He believed Kettles deserved the Medal of Honor, and he started contacting Kettles' old battle buddies for statements. He got Congress and the Army to reopen Kettles' file. "He definitely deserves the Medal of Honor," said Smith, who left the Army as a staff sergeant decorated for valor after three consecutive tours in Vietnam. He noted his children, grandchildren and great-grandchildren have Kettles to thank for their lives too. "I really can't express how much respect I have for him. I'm sure it had to take a lot of courage. He might have been doing his job, but he did a hell of a good job." Kettles, who credits the helicopter instead of his flying skills, prefers to see the medal as recognition for everyone who fought that May 15. 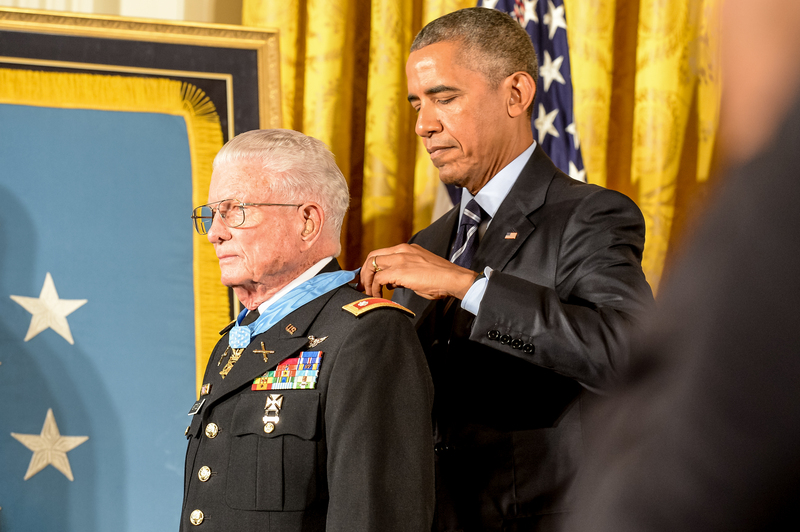 "The Medal of Honor is not mine alone," he said. "You've got 74 crewmembers out there. … It belongs to them as much as it belongs to me. "The bottom line on the whole thing is simply that those 44 did get out of there and are not a statistic on The Wall in D.C. The rest of it is rather immaterial, frankly." Click here to view the images taken at the White House and Pentagon ceremony's as well as some at the Army's Reception at the hotel on Sunday. The White House Medal of Honor ceremony was Monday the 18th, followed by the ceremony at the Pentagon on Tuesday the 19th. The above link is the Army's website and the images are from the Army's photagraphers who did a much better job than I could have. Same for the link below. Professional photographer. Click here to view the images taken at the dinner Tuesday evening at the Hay-Adams Hotel in DC. USA Today Has a very good article on the events on May 15, 1967 rescue mission.